A defining aspect of the scientific success of any telescope installation is its ability to deliver cutting-edge data through novel instrumentation. An exciting and extensive instrumentation development program exists for GTC. The telescope can currently host up to two instruments for its Nasmyth foci. Further instruments may be installed in the two folded-Cassegrain foci that are currently being prepared, and ultimately also in the main Cassegrain focus. In order to maximise the scientific return from the GTC, telescope is prepared to accept visitor instruments as they can bring additional capabilities to the GTC not available with the suite of facility instruments. The procedures for proposing a Visitor Instrument to the GTC, and the rationale for visiting instruments are explained in this document. Also, of interest for any possible instrument developer, the discussion on the general roules for the distribution of Guaranteed time, both for facility instruments and visitor instruments, are described here. On this table a summary of present and future GTC instrumentation is given (instruments available for the ongoing semester are highlighted in green, while instruments decomissioned are highlighted in grey). (later Cass) 0.36 - 1 µm Common-user instrument. It will be dismounted at the arrival of GTCAO in early-2020, and will be moved to main Cassegrain station once available (estimated in early-2020). 7.8 x 7.8 arcmin field. Broad- medium- and narrow-band imaging. Spectral resolutions 300 to 2500. Folded Cass-E 8 - 25 µm Common-user instrument. Operational from 2012 to 2016. Decomissioned in April 2016. Back to the telescope in Folded Cass E station by early-2019, sharing this focal station with HIPERCAM until the arrival of MIRADAS in late-2019. 26 x 19 arcsec field. Spectral resolutions 175 to 1300. Folded Cass-E 1 - 2.5 µm Visitor instrument (University of Florida). Decomissioned in September 2017. 3.4 x 3.4 arcmin field. Nasmyth-A 1 - 2.5 µm Common-user instrument. Operational since 2017. 6.67 x 6.67 arcmin field (imaging). 4 x 6.67 arcmin field (spectroscopy). Long-slit and multi-object spectroscopy through configurable cold slits. Nasmyth-B 0.4 - 0.7µm Visitor instrument (IAC). Operational since 2019. Point-source fiber spectroscopy. Folded Cass-E 0.36 - 1 µm Visitor instrument (IAC, University of Sheffield). It will share this focal station with Canaricam until the arrival of MIRADAS in late-2019. High-speed, multi-band imager. 2.8 x 1.4 arcmin field of view. Folded Cass-F 0.4 - 1 µm Common-user instrument. Operational since 2018. 3.5 x 3.5 arcmin field (MOS mode) and 12.5 x 11.3 arcsec (IFU mode). Up to 100 objects simultaneous through positionable fibres. Spectral resolution 5500 to 20000. Folded Cass-E 1 - 2.5 µm Common-user instrument. To be installed in late-2019. Operational early 2020. Up to 12 targets via deployable probe arms, each feeding a 3.7 x 1.2 arcsec field of view. Multi-object spectroscopy with up to 12 objects. Nasmyth-B 1 - 2.5 µm Common-user instrument. To be installed in 2020 (GTCAO). Operational by 2021 (GTCAO+FRIDA). Imaging and integral-field spectroscopy. spectral resolution 1500 to 30000. 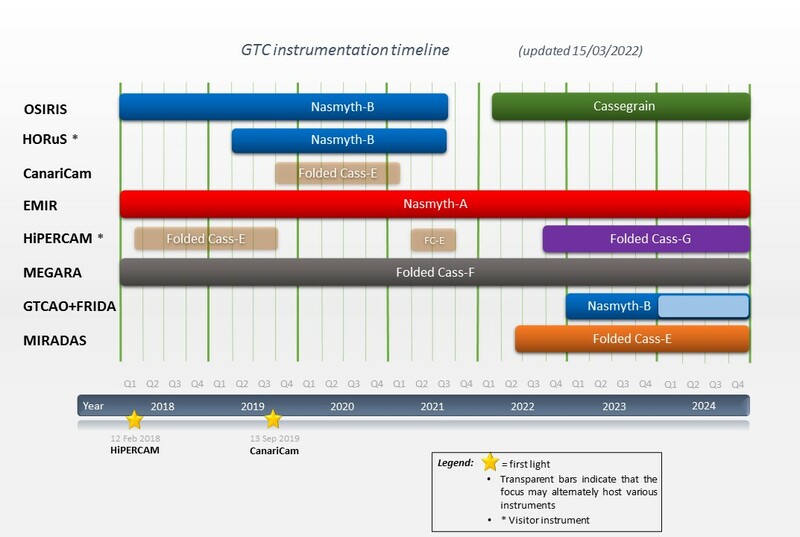 Current timeline for GTC instruments in the period 2016-2021. The first two instruments were delivered to GTC to populate the Nasmyth-A and -B focal stations. The very first instrument for scientific use was OSIRIS, which started operation when the telescope commenced its scientific life, in March 2009. OSIRIS works in the optical wavelength range and can be used for high-quality imaging and longs-slit as well as multi-object spectroscopy. The arrival of GTCAO+FRIDA in 2020 will occupy the Nasmyth-B focal station and will move OSIRIS to main Cassegrain focus of the telescope. The second instrument CanariCam came on-line in 2012, after a long period of preparing the telescope for it (in particular the chopping motion of the secondary mirror and achieving getting the primary mirror segments in phase). CanariCam is a thermal infrared camera and spectrograph with polarimetry and coronography capabilities. CanariCam was in operation up to April 2016, when it was removed from the Nasmyth A focus to be placed in one of the folded Cassegrain focal stations later, or share it with another instrument. These first two instruments have been developed by consortia formed by several research centers. The consortium that developed OSIRIS was led by the Instituto de Astrofísica de Canarias (IAC), with the participation of the IA-UNAM, IFCA and IAA. CanariCam was built by the University of Florida. In December 2014 we received and installed the first visitor instrument, CIRCE, from the University of Florida. This instrument, designed and built on initiative by Prof. Eikenberry, was commissioned along 2015 and will deliver important near-IR imaging capability to the telescope. The instrument may be upgraded for spectroscopy. Although being formally a visiting instrument, it was made available to the general community since September 2015 for two years, being finally decommissioned in September 2017. A second visiting instrument, HORuS, has been developed at the IAC (PI: Dr. Carlos Allende Prieto) and it was commissioned along 2017-2018 in order to start operations in 2019. This instrument will deliver high-resolution spectra of point sources in the optical wavelength range. It is expected to be highly stable, which is of interest for science projects such as studies of extra-solar planets. By the end of 2017, HiPERCAM instrument was received at GTC and operations started since early 2018. This instrument is a high-speed camera for the study of rapid variability in the Universe. It will be able to image simultaneously in 5 optical channels - u' g' r' i' z' - at rates of over 1000 frames per second. As the only 8-10 m-class telescope in the world with such a facility, the GTC would become the world-leader in follow-up studies of variable and transient sources. The next common-user instrument that was built for the GTC is EMIR, a multi-object spectrograph and imager for the near infrared. With its cryogenic configurable slit unit and medium spectral resolution this instrument is expected to become one of the work-horse instruments. EMIR was developed by a consortium led by the IAC and arrived at the telescope in 2016 for its on-sky commissioning, starting the regular operations on mid-2017. FRIDA is another instrument for GTC that is being developed. FRIDA, will make use of the GTC Adaptive Optics system, being able to take pictures in broad-band and narrow-band filters, as well as facilitate integral-field spectroscopy in the spectral range of 0.9 - 2.5 μm. FRIDA is a project led by the Instituto de Astronomía de la Universidad Nacional Autónoma de México (UNAM) in partnership with the Instituto de Astrofísica de Canarias (IAC), the University of Florida (UF), and the Universidad Complutense de Madrid (UCM). The instrument is in its phase of construction and is scheduled to arrive at the telescope in 2021. Development of instrumentation is a long process and hence for its planning one must look several years into the future. In order to help define the progression needed to keep GTC scientifically competitive throughout the decade ahead of the year 2008, an independent panel was tasked with analyzing GTC´s future instrumentation needs. Recommendations provided by this work panel can be found here. Based on the outcome of this study, it was decided to proceed with the development of two medium-dispersion spectrographs, one in the visible range and another in the near infrared, to be implemented in the telescope around the middle of the next decade (2015/2016). After a competitive process, in late 2010 the MEGARA and MIRADAS instruments were selected to proceed. Currently MEGARA has successfully completed its commissioning on August 2017, starting the regular operations on mid-2018. MIRADAS has successfully completed the review of its final design and initiated its construction phase. Current schedule shows the installation of MIRADAS in the GTC at late-2019. In 2013 a new independent panel was tasked with review the instrumentation plans at the GTC and to advice on priorities. Recommendations provided by this work panel can be found here. As described above, present instrumentation plan at the GTC will be completed around 2022. At that time, six or seven science instruments will fill the large suite of focal stations of the GTC, so they should guarantee the scientific competitiveness of the telescope for several years to come, also considering that the GTC will continue to be the largest optical telescope in operation. Even so, it is time to think about the future. Defining and building new instruments is a complex process that takes a minimum of five years. This puts us to around 2025, when the new generation of extremely large telescopes will presumably start operation. On this regard, GRANTECAN has opened a process to define the next generation of GTC instruments. Details on this call and current proposed instruments can be found here.